A SWOT analysis format need not be boring. 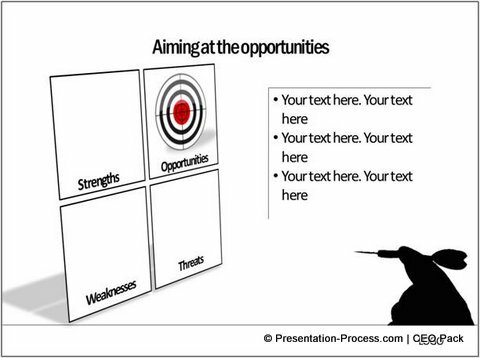 Discover 3 interesting alternative templates to spice up your next business presentation. 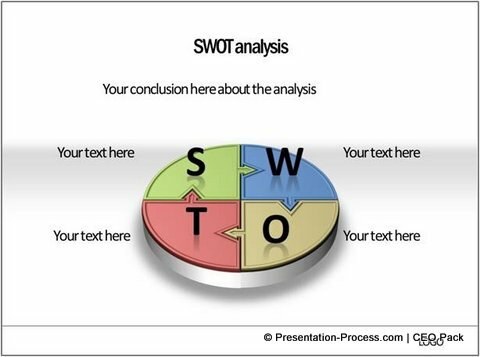 Be it a business strategy presentation or a marketing presentation, SWOT analysis is usually an essential component of the slide deck. Most of the SWOT templates look fairly dull and boring. 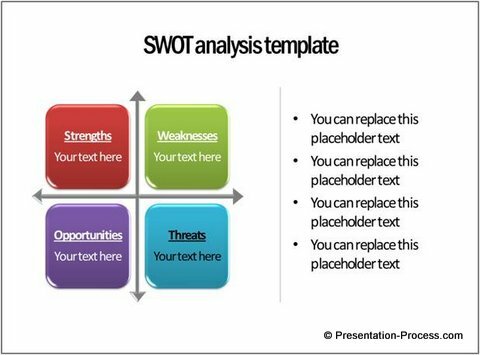 In this article, we will explore three different options to create stunning SWOT diagrams. SWOT is a useful framework to analyze the Strengths, Weaknesses, Opportunities and Threats involved in a project or business venture. 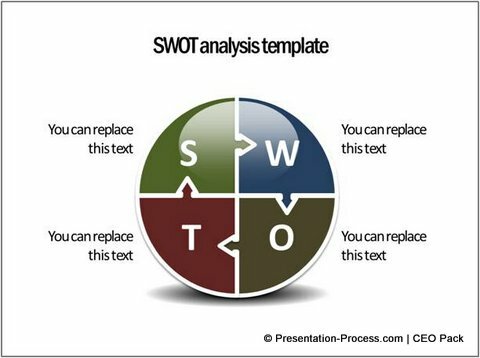 SWOT analysis helps business planners to evaluate the attainability of a set objective. While the template looks good, it helps to create some alternative templates to help us achieve some specific objectives. This format allows you to have enough space for each of the four quadrants. This can be quite handy for business presentations where you need in depth analysis of the situation, rather than a superficial account. Once you finish dealing with all the four quadrants, you can bring back the first slide again (Zoom out) to summarize the points discussed. Simple and relevant icons and images add a deeper context to your templates. 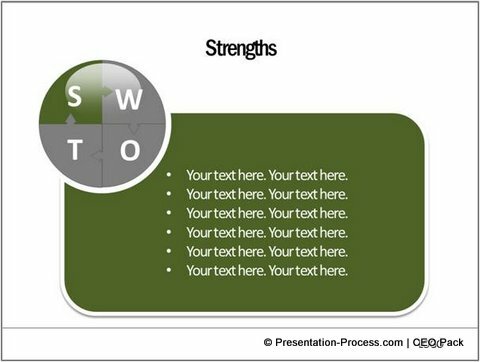 Browse through some free icons available on the net to add more depth to your next SWOT presentation. These kinds of templates are quite useful when you want to attract the attention of your audience in a brand presentation. The design studio feel of the template reflects the image of your offering. If you are a business presenter, the more options you have to express an idea, the more effective is your message delivery. 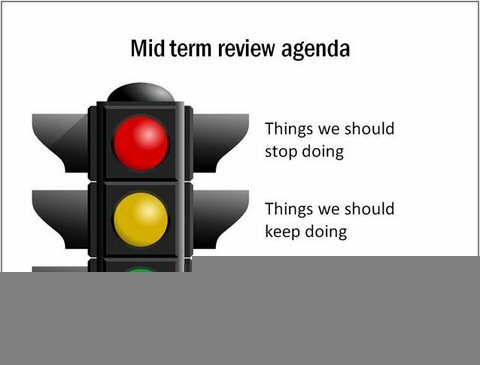 But, most business presenters (like you), don’t have the time to create these elaborate templates. That is why we came up with our ‘750+ PowerPoint Charts and Diagram Templates pack for CEOs’. The templates in this article are from the pack. We realize that you need a solution that requires you to expend minimum effort and time, and yet deliver remarkable results for your business presentations. That is why we made all our 750 diagram templates to be fully editable. You just need to copy our diagrams to your slides and replace the sample text. Your presentation gets ready in minutes. If you are a business presenter, we recommend you browse through our diagram templates collection. You will discover a whole new way to make presentations in an efficient way forever.